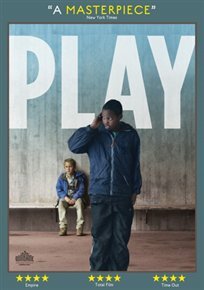 Three schoolchildren find themselves the victims of a group of young black con artists in this Swedish racial drama from director Ruben Östlund. After approaching three local boys – two white and one of Asian descent – in a Gothenburg shopping mall, a group of black teenagers accuse one of the boys of owning a stolen mobile phone belonging to one of their brothers, demanding that they accompany them on a short trip so that the brother can resolve the issue. Over the coming hours, as the streetwise black youths play a psychological game, preying on the fears and stereotypes of their victims without ever resorting to direct violence, the reserved, anxious-not-to-offend local kids are led on a march through some of Gothenburg’s more unfamiliar areas. The film sparked fierce debate in Sweden, was the film about race or class and also the wider Swedish narrative of a country divided by “us,” the Swedes and a “them” who are foreigners.